“Symbiote” opened this week at Newcastle Art Space. This is the first solo exhibition by photographer Michael Randall since winning the Newcastle Emerging Artist Prize last year. Michael has a Bachelor of Fine Art (Honours) from Newcastle University and is currently working full time to support his art practice. In cases in which a distinction is made between two interacting organisms, the symbiont is the smaller of the two and is always a beneficiary in the relationship, while the larger organism is the host and may or may not derive a benefit. In conversation with Michael earlier this week, he discussed his ideas about the role of traditional versus digital photography, his love of the study of the origin of words (etymology), and his interest in the relationship between the natural world and our human interaction, impact and influences upon it. Would the natural world flourish if humans ceased to exist? Do we need the natural world and are they tolerating us? His new works are self portraits in which Michael has staged himself in conversation with aspects from the natural world. 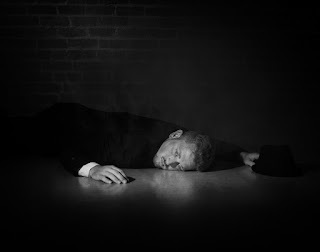 While using a digital camera and output, Michael voiced his belief in the significance of maintaining the hand-made aspect of making a photograph. 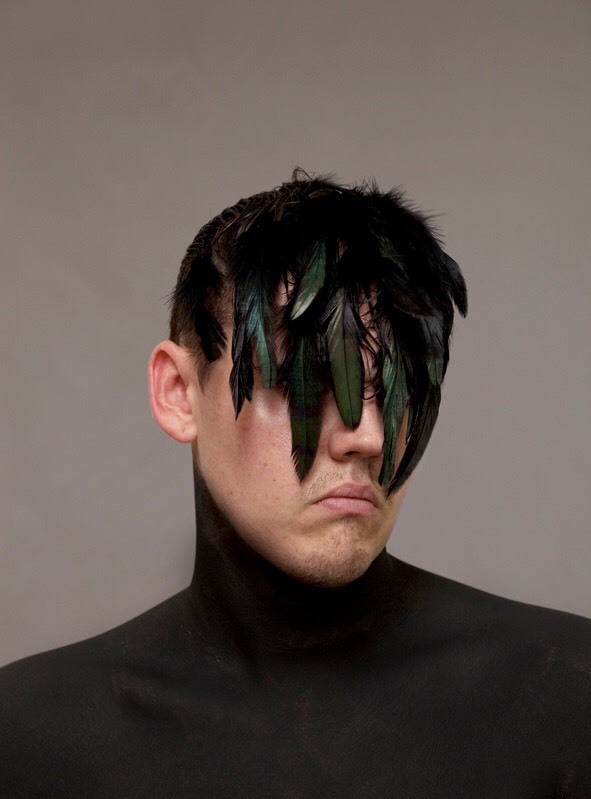 To this end, he paints and decorates his face and body in real time so that everything necessary can be found on the digital negative. Photoshop intervention and alteration is reduced to that found in minimal dark room processing. It must be his hand that controls the shutter-release cable and takes the exposure as he wants to stay connected to the process and not off-load any aspects, if at all possible. These are absolutely beautiful images and while, of course, any art work may have autobiographical elements, Michael both exposes and hides himself within these self portraits. 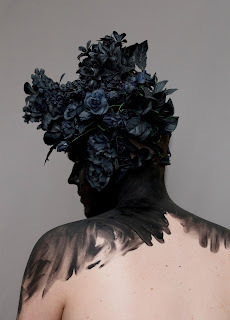 He paints his body in white, chocolate and black paint to play with ideas about identity, culture and ethnicity, even though these are not necessarily conscious connections being made by the artist. In one work, in particular Michael talked of literally painting himself out of the picture completely and letting nature be the stronger. In other works Michael has directly attached plant species with human spine-like lines over his own spinal structure. The plant species visually support and strengthen his body in an area where he now has a fine surgical scar to repair physical damage. In another, his shoulders and upper body are covered in flower petals from the family garden. The plant had ceased to flower each year, and only after the family buried the loved family dog near the tree did it burst with new life and colour. A new interdependent relationship was formed in the natural cycle. From my viewer perspective, I am so excited about the strength of this work and the beauty and balance within these works. While my connections to the works, tell the combined story of my physical viewing of the work mixed with my own interpretation of visual clues that I found within the work, this experience may be different for every new viewer. That is the magic of photography and the wonder in art. When he was a small boy, Joerg Lehmann was being pushed in a pram through the dark alleys and streets of Germany by his great grandmother. As a street light broke into the darkness, the young boy spoke his first word – licht (German for light). Joerg has been fascinated with light ever since and with a father and grandfather both amateur photographers, the love of the camera and photography was destined to be absorbed by Joerg. 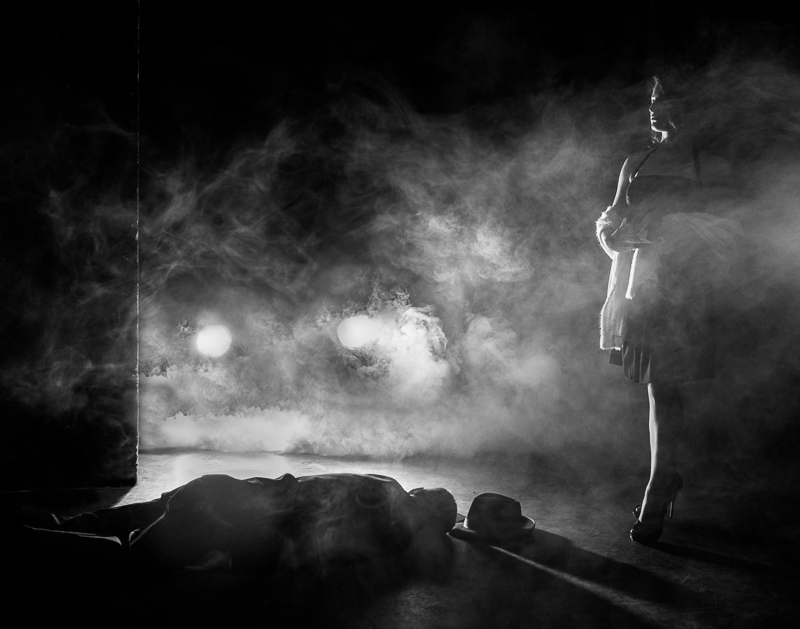 While Joerg has sold work and undertaken commissions, his current work Film Noir, Storytelling with Photography, marks his first solo exhibition as a photographer. Joerg comes to Newcastle via, Melbourne, San Francisco, California and Germany, settling in Newcastle in 2014. He is a husband and father and currently works in radiation therapy at the Calvary Mater Hospital as a research physicist and is an Associate Professor with the University of Sydney. He is an Accredited Professional Photographer (APP), a Certified Professional Photographer (CPP) with the Professional Photographers of America (PPA), and certified by Special Kids Photography of America (SPKA) with specific training to sensitively work with children with special needs. 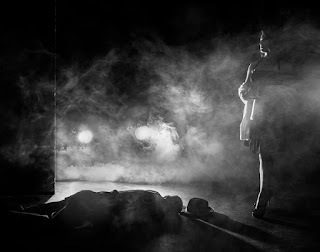 His current work is presented in the style of Film Noir which refers to a style or genre of cinematographic film marked by a mood of pessimism, fatalism, and menace. The term was originally applied (by a group of French critics) to American thriller or detective films made in the period 1944–54 and to the work of directors such as Orson Welles, Fritz Lang, and Billy Wilder. Joerg has been working in this style for the last five years. Stepping into the room is like stepping onto a film set and his photographic skill is evident on every surface within this space. The images are positioned along the gallery walls as if they are one large strip of black and white film. Each sequential image tells an individual story and collectively they reflect the whole story board. These are finely and exquisitely composed images, depicting stories of mystery, intrigue, murder, and the role of the Femme Fatale. The drama, constructed elements and the lighting are all perfect. If the picture plane of any image was crossed, it would be easy to close your eyes and imagine, hearing the film Director calling out “Action” and the characters would walk into the next frame. In these works, Joerg takes on the role of photographer, director, producer and lighting designer and brings each photographic still to life. He works in close collaboration with other creatives, including makeup artists and costume designers as part of the process. Technically these are digital photographs printed mostly as silver halide archival prints. Joerg sourced the 8ply museum rag mats used in the frames from the United States specifically for these works. These are a small limited edition range of prints so a red dot does not mean the entire edition has been sold. Talk to Joerg and gallery staff for details. Anyone who enjoys black and white photography and the nostalgia of early film-making must see these works. Definitely an enriching experience talking to Joerg this morning.